Enhance your kitchen with this Breakfast Table and Cushion Stools. Table features a drawer at each end and finished in solid wood with Antique Walnut Finish. Drawer dimension 11.34"W x 13.19"D x 3.5"H. The set comes with 2 Mona Cushioned Saddle Seat Stools. Cushioned is made of Faux Leather in Black with Solid wood frame in Antique Walnut Finish. Assembly Require for table and stools. 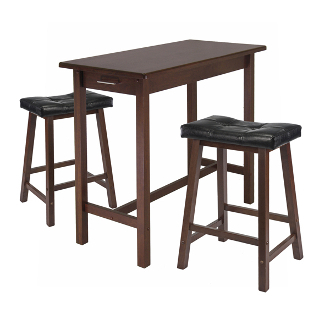 Include 2 Cushion Seat Stools size is at 17.48"W x 14.49"D x 24.84"H; Seat dim is 17.48". x 10.1"D.